Online DISC Accreditation, DISC Personality Test, DISC Profile, DISC Assessment. Online certification options anywhere in Australia call 1800 768 569. Sharon is accredited in and has been an avid user of, a range of psychometric instruments and workplace assessment tools for over 25 years. Sharon has been delivering Extended DISC Accreditation Training since 2004, and undertook her training with Jukka Sappinen, the founder of Extended DISC International and creator of the Extended DISC System. Sharon will take a personal interest in your business and your success, and is always ready with free ongoing support and professional assistance and advice. We invite you to contact Sharon to discuss your DISC plans and training needs. Ask her, why she recommends Extended DISC over the myriad of other DISC based products on the market. You will be very surprised by what she tells you. Following a high achieving career, sparkled with awards and recognition, in a variety of senior Human Resource and Organisational Development roles spanning the public, private and not-for-profit sectors, Sharon brings a wealth of practical experience to our accreditation training. A subject matter expert, of world renown, Sharon is an insightful and enthusiastic business advisor who is more than willing to share her wealth of experience with our clients. As an academic, Sharon has under and post-graduate qualifications in Business, Human Resource Management, Adult Education, Training and Assessment and Management Psychology. As a workplace trainer, she has designed and delivered training packages and assessed participants at the Certificate III, IV and Diploma levels. The packages included Training & Assessment, Business, Frontline Management, Project Management, Office Administration and Government under the Australian Qualifications Framework. What you get: Experience + Expertise + + Excellence = Exceptional in every way! Why Extended DISC Accreditation Training? Extended DISC (ED) Reports are different to other DISC reports on the market. When you understand how the information gathered from the respondent is structured and organised by the algorithms in the ED software (the back end of the system that generates the analysis) you have a much more in-depth and comprehensive understanding of what the results represent, and how they display in the person. Having a solid understanding of the DISC Theory of Human Behaviour is important. Once you have that understanding you can take it to a whole new level with knowledge about the ED model, which calls on other motivational and leadership theories in addition to simple DISC. With Extended DISC you have an industrial strength tool, which can be applied with a light and breezy touch, to brush over the surface, which is great for basic communication training and consciousness raising. But, when you need a laser sharp, rigorous tool with exceptional accuracy to solve employee issues and drive productivity, performance and innovation Extended DISC has all the rigour and vigour you will need. Our accreditation training enables you and your clients to harness the power and potential of the FinxS and EDOS reports. You will also learn business strategies to sell and up-sell the different products already built into your ED System. Sharon has developed many training resources and strategies to assist in your DISC initiatives and to embed DISC your and/or your client's organisation. These are available to you as well, as a Talent Tools client. 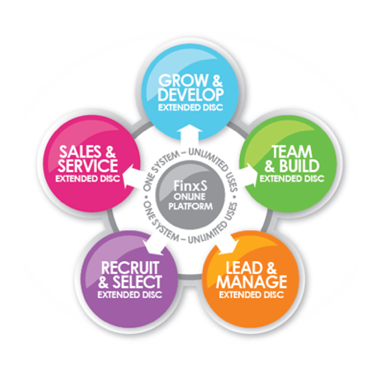 Training in Extended DISC, brings out the full potential of the FinxS and EDOS reports so you can bring added value to your business or your client's business. You have the opportunity to learn, understand and practice using the Extended DISC model in a fun and informal setting. We ensure you are up to date with any operating system upgrades and advancements in FinxS assessments. Our public training programs are run on a regular basis throughout Australia, New Zealand and anywhere in the world you are or want to be. We can easily deliver a course near you. Contact us with YOUR preferred dates and location. You will be amazed at our flexibility and service levels. Please contact us if you would like to be trained in the administration of the system - EDOS or FinxS. These modules are delivered one-on-one, live online using our live virtual training platform. This training is to introduce you to understanding and using DISC in a business/workplace context. You will be introduced to how our software operating systems (EDOS and the new FinxS platform) learning how to invite respondents to complete the online questionnaire and generate reports using your own administration portal. At the conclusion of the course, you will be ready to start using Behavioural Analysis reports in the workplace environment! Day One will introduce you to understanding the DISC model and its use in a business/workplace context. This is a special one-day only workshop for people who have done the Introduction to Extended DISC course or Accreditation Training. Only a limited number of places available. We will be concentrating on a wide variety of elements but we will delve deeper into the first two levels of interpreting the Profiles. We will ensure you have a good understanding the ten 'Special Cases' and look at how these are linked back to certain behaviours. You will also be refreshed on how to interpret and utilise the Extended DISC shotgun map (that relates to team tasking and team fit) as well as how to link in-depth behaviours of the styles to their avoidance issues. DISC Accreditation Australia by Talent Tools DISC assesses individuals across four highly defined categories: Dominance, Influence, Steadiness and Conscientiousness. DISC assessment is internationally recognised as a series of psychometric tests that help individuals and teams identify their behavioural styles. Once individuals and organisations are aware of their DISC profile, they are better informed about their own behaviours and how those behaviours can manifest in their interactions with others. For organisations and businesses, DISC assessments are a valuable tool that helps with communication, team collaboration, skill building and much more. Many businesses therefore now want to integrate DISC accreditation into their employee development plans. This helps them effectively to apply the results of DISC testing in their workplaces. There are several online DISC accreditation services available. Talent Tools provides arrange of DISC Accreditation training options including Extended DISC Accreditation. eDISC and Taking Flight with DISC for individuals, businesses and organisations. Talent Tools is headed Sharon Hudson who has over 25 years of working with workplace psychometric instruments and has delivering DISC Accreditation and DISC based workshops since 2004. 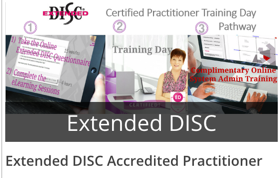 Sharon provides some of the best training in DISC Accreditation Sydney has to offer. 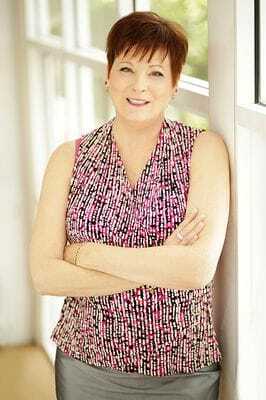 She has won many awards and secured broad recognition in HR and Organisational roles, working in both the public and private sectors, as well as for not-for-profit organisations. Sharon has comprehensive and highly practical experience which she is only too happy to share. Under her wing, Talent Tools has brought DISC Accreditation Melbourne to local businesses and companies, as well as in the rest of Australia, New Zealand and internationally, where they are always met with enthusiasm and satisfaction. Sharon and the Team at Talent Tools are always ready to discuss how Talent Tools can enhance an organisation's performance and help them get the best from their employees and we invite you to contact us at Talent Tools and hear what she has to say about the myriad of other DISC based products and services available: you may be pleasantly surprised by her response. If you are a business or an organisation, you are probably looking at a DISC accreditation because you want solid results that truly reflect the abilities of your tested subjects. Extended DISC has far more workplace applications than simple DISC options. Not only does Extended DISC allow you to identify the DISC styles of your individuals, teams and work-pairs, but the detailed knowledge you acquire through the Extended DISC training, gives you a much, much more comprehensive understanding of the person and how they are being affected by their role and workplace environment and how to get the best from them as an individual contributor, team member and leader. Accreditation Training in Extended DISC is essential to be able to unlock what the Profiles reveal but is not written in the report, as well as to understand why and how Extended DISC reports so accurately reflect the subject's natural, unconscious behaviour. The Extended DISC insights provide you with solid foundations upon which you can implement effective decisions for adapting your organisation's behaviour to achieve maximum benefit from your employees and to place the right employees in the right roles and environment in their workplace. This kind of adaptation is central to the strength of a workplace because this adaptability is the pivot for many kinds of effective collaboration and communication. Once your have completed, your Extended DISC program, DISC Accreditation and your DISC Accreditation training allows you to customise tests and assessments according to different work positions and their requirements. It enables you to more effectively interpret the results and implement successful solutions, training programs and to assign employees to positions that benefit the employee as well as your organisation. Extended DISC Accreditation is highly relevant for coaches, HR professionals, Trainers, Recruiters and Facilitators. Your Extended DISC Accreditation allows you to read, successfully comprehend and accurately analyse the individual at hand. It further allows you to interpret your work-pairs and to correctly read and analyse your team analysis reports. Talent Tools provides DISC Accreditation training online, as one-on-one training with the Master Trainer, or online as scheduled DISC Accreditation webinars. Talent Tools will soon release their new self-paced online DISC Accreditation training. Both eDISC and Extended DISC Accreditation are available online at Talent Tools. What are the benefits of being DISC accredited and able to read and analyse the reports in this way? The benefits are multi-faceted and varied. With this eDISC accreditation provided by Talent Tools, you are in a better position more successfully to recruit employees, develop training programs and effectively design coaching methods and programs. All of this, in turn, feeds into the success at your workplace, which obviously translates into better results for your clients or customers and your company. Extended DISC Accreditation and Extended DISC assessments will give your organisation significant benefits over other DISC programs and accreditations. One of the things that is specific and unique about Extended DISC training is the "back-end", behind-the-scenes training that you receive. Understanding fully how the respondent's information is arranged and structured by the Extended DISC algorithms, will give you a finely detailed understanding of the results, which can also be fine-tuned to your organisation's specific requirements. The Extended DISC algorithms are responsible for generating the Extended DISC analysis reports. Once you understand the specific relevancies of the algorithms, you are better equipped to understand the results. This means you have a more in-depth understanding of what the results display and how they manifest in a certain person or team. The Extended DISC model also draws upon proven leadership theories and theories of motivation to help people modify their behaviours in the workplace. This means the Extended DISC model takes the traditional DISC results a step further by compounding them with the best practices of leadership and motivation. The Extended DISC questionnaire has been carefully constructed to be low in face validity, which results in high report validity and reliability resulting in far more accurate and relevant person information.. If you are a business who wants to, for example, solve employee issues or other areas of weakness at the workplace, you need a laser sharp focus on the identification and, more importantly, the interpretation of behavioural styles. Extended DISC allows you to see how complex behaviour dynamics manifest in your workplace environment and provides direction in successfully addressing these issues. You are encouraged to access the support and help you will receive from Talent Tools you will be able to accurately and precisely identify the problems at your workplace and develop strategies to overcome these areas of weakness and correct them. When you are an Extended DISC accredited practitioner or consultant or eDISC certified, you have the license to deliver training, use and sell Extended DISC and eDISC products. Talent Tools will also teach you the business strategies that help you sell or up-sell your Extended DISC or eDISC products. Whether it is employee training or testing, you will gain the complete toolset needed to produce and offer these products in a way that is relevant, results-oriented and returns on your investment. The training resources and workshops developed by Talent Tools allow you to start new DISC initiatives, integrate Extended DISC or eDISC tools with your organisation's system, or within your client's organisational systems. Our training will allow you to customise and fine-tune your products specifically for your organisation's or your client's different requirements. Whether you are embarking upon this training for your organisation, or whether you want to start a consultancy in DISC Accreditation Perth or anywhere else Talent Tools training is the perfect place to start your new career. You will spend a full day covering the background of the Extended DISC®model of human behaviour and looking closely at the 4 main behaviours. You will gain an understanding of how people are motivated; approach tasks and goals; experience stress; and are likely to communicate at work. This full day course will also explain how to debrief the Extended DISC Profiles and the diamond, and identify important 'emotions' seen in graphs though the 10 special cases. You will also learn about why Extended DISC® profiling is so commonly applied in the business environment and how easy the FinxS platform is to use in administering reports for yourself or for a client. The first level of accreditation. You will learn about the background of the Extended DISC model of human behaviour and look closely at each of the 4 main behaviours. You will gain an understanding of how the styles relate to the way people are motivated, how they approach tasks and goal, what stresses each of the styles and how they are likely to communicate in their work environment. You will be introduced to how our software operating systems (EDOS and the new FinxS platform) learning how to invite respondents to complete the online questionnaire and generate reports using your own administration portal. Whether you are attending this training on behalf of your organisation, or you are looking to gain this understanding for your consultancy or practice business, this introductory workshop will take you through a delightfully fulfilling journey. You will learn to debrief DISC reports, whether in a one-on-one coaching situation, a coaching or training exercise or a mentoring environment. You will learn how to interpret the results to help you in your recruitment processes, and you will be able to make informed decisions in your company's employee selection process. You will also learn how to deliver introductory DISC training. Whether it is in the form of, for example, conflict resolution workshops, leadership workshops, communication workshops, project management workshops or even sales workshops. You will gain an understanding of the four behavioural styles and how they correlate to each other. You will also understand how people approach different tasks, how they are motivated and how they communicate. You will learn how to use the software to generate reports and conduct tests. There will be a special emphasis on the Extended DISC Online System (EDOS) and FinxS. We look deeper at the Behavioural Styles, their strengths and weaknesses, causes of stress, motivators, communication challenges, approaches to others etc. and how these relate to both our performance success and satisfaction. Extended DISC® theory helps us understand how our Behavioural Style Profiles ('Natural' and 'Adjusted') are created, graphed and mapped on the Extended DISC® and Flexibility Diamonds. Learn about unique team roles and the dynamics of communication at an interpersonal and organisational level. Practice recognising and analysing behavioural shifts, with reliable data and easy-to-read psychometric reports. At the conclusion of the course you will have a comprehensive understanding of Behavioural Styles. You will have all you need to 'debrief' a Behavioural Analysis (or Personal Analysis) Report confidently, use data to help delve into how individuals see themselves and their world, and to offer crucial insights into behaviour that enable people to improve their job performance and satisfaction. An internationally recognised Certificate of Accreditation (allowing you to advertise your level of Extended DISC® knowledge and conduct your own Introductory Training Course). FREE VIP website access (containing great technical support material and further resources). This intensive and rigorous training allows people to attain the highest level of DISC accreditation and professionalism. The certified extended DISC training builds upon the Accredited Practitioner training. Day 1 of this workshop covers the introductory training, while Day 2 moves rapidly ahead to enhance the concepts learnt in Day 1 training and transform you into an Accredited DISC Consultant and Facilitator. You Will Learn to: apply what you have learnt in Day One in practical workplace scenarios, further developing your knowledge and understanding of the four basic DISC styles; advance to understanding profiles with a combination of two or three styles, and learn how presents in an individual; examine the 'Special Cases' which helps us to understand what affects the person's current environment is having on them, at, and away from work; learn how to identify the strong emotions the person is feeling at the time of completing the questionnaire and understand how they are feeling; be able to explain how an individual's natural behavioural style influences their engagement and productivity; discover the relationship between people's natural behavioural style as an individual and their performance in team environments; recognise all the 'Special Cases' that give us great insight into the emotions involved in modifying our behaviour to suit the needs of our current environment; learn to recognise a range of common profiles and be able to associate that instantly with a range of typical behaviours; unlock the mystery of how each of the Extended DISC Profiles and Diamond are created from the responses to the questionnaire. This will allow you to get the maximum benefit and understand the usefulness of eDISC reports. Also you will learn different ways to successfully apply positive psychology theories and to understand the complexities of the theory of human development. You will also learn about modern neuroscientific advances and how this information is applied and reflected in the four different behavioural styles. This workshop will also provide you with the essential understanding of: Work Pair Analysis Team Analysis 360 Degree Feedback Organisational Surveys Customer Surveys Testing Centres Additionally, the training at Talent Tools will give you the important opportunities to: be able to practice providing feedback with your trainer when you start working with reports receive confidential one-on-one business development assistance be able to call and discuss a proposal you are preparing or discuss best approaches for individual clients get one-on-one training and support with your online portal gain access to Talent Tools developed proprietary products and materials and additional DISC tools and products Once you have completed the course you will receive the following benefits: Opportunity to provide added value to your clients as a consultant with new products and skills and be able to utilise them immediately. An internationally recognised Certificate of Accreditation, allowing you to advertise your level of Extended DISC knowledge and conduct your own Introductory Training Courses. Access to our website VIP area which is full of support material and additional resources. Be able to produce your own reports at the touch of a button - with zero administration, at a fraction of the cost of engaging an externally accredited practitioner and to invoice your client directly. No ongoing fees or minimum product use requirements. Advanced Refresher Workshop The Advanced refresher workshop is a one-day workshop for people who have either attended the Introductory Training or the Full Accreditation training. This refresher workshop aims to delve deep into certain areas of Extended DISC. For example, it will touch upon the most common kinds of Extended DISC profiles and what they mean and how they can be manipulated. You will also be taken deep inside the understanding of the 10 "Special Cases" and how these link to certain behaviours. You will also be taught how to better use and interpret the Extended DISC Shotgun map which relates to "team tasking" and "team fit". You will also gain a good understanding of how to link the in-depth behaviours of each of the styles to the person's avoidance issues. Contact Talent Tools Today and Transform your Life! So if you are thinking about DISC Accreditation Brisbane or indeed anywhere in Australasia we strongly suggest that now is the time to get in touch. Get in touch with us here for our Extended DISC training schedules in your area or to schedule a training session on demand! Talent Tools head office is located in Brisbane, Australia. Talent Tools DISC Accreditation training and workshops are available globally. Talent Tools delivers in all Australian capital cities on a regular monthly schedule and makes annual visits to other locations, such as Doha, Dubai, Hong Kong, Jakarta and New Caledonia. Please contact Talent Tools to arrange your DISC Accreditation training anywhere in the world. The material on this page is the proprietary property of Talent Tools with full copyright rights. Copying of this content without the express written permission of Talent Tools is unlawful and our copyright rights will be enforced.